The Griffin Beacon is a universal remote control app and hardware combo that can be used with a huge number of living room devices. Instead of an attachment for your iPad, iPhone or iPod touch, it works using a separate infrared box which links through Bluetooth. The box must be placed within range of all the devices you want to control. This might be a problem if (for example) your stereo is in a different part of the room to your TV and video. After an initial pairing, you re-establish the connection by switching on Bluetooth on your iOS device and pressing down on the Beacon, so there's no lengthy reconnection process to go through. 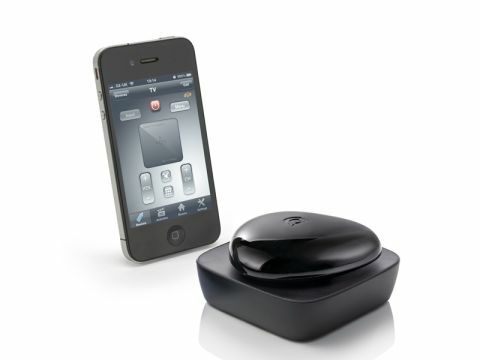 The actual remote controlling is done using a free third-party app. Simply browse for your remote by device type and manufacturer, and the app lets you test several different remotes to see which is the right one. We found it infallible when pairing the various remotes in our living room, though as we started to watch an episode of 24 we realised we were actually watching the wrong one and our Toshiba DVD player iPad remote had the Menu button greyed out. We managed to get it back by pointing the original Toshiba remote at the Beacon and pressing the appropriate button. At £61, the Beacon is a mostly impressive device for a fairly good price. The inconvenience of connecting to Bluetooth devices within iOS has been kept to a minimum, while the app is slick and can easily learn the commands it doesn't have the details for.